these have been painted by Douchkine. I have seen them and some more in May 2005 at Drouot and took some pictures I add below. Dear Bob you are looking on the wrong carriage. I wrote "the carriage at top left". That without the ladies. The figure is issued by Hafer and the though is to take away one right arm of the speerman in order to have two slightly different figures. Beautifully painted figures in the style of Douchkine. No reason for me to doubt their authenticity. I have only given the reference that the seller has given, they are not my figures. Perhaps one of the more experienced collectors within the group can give their opinions. I can only see one right arm and one of the woman's leg. 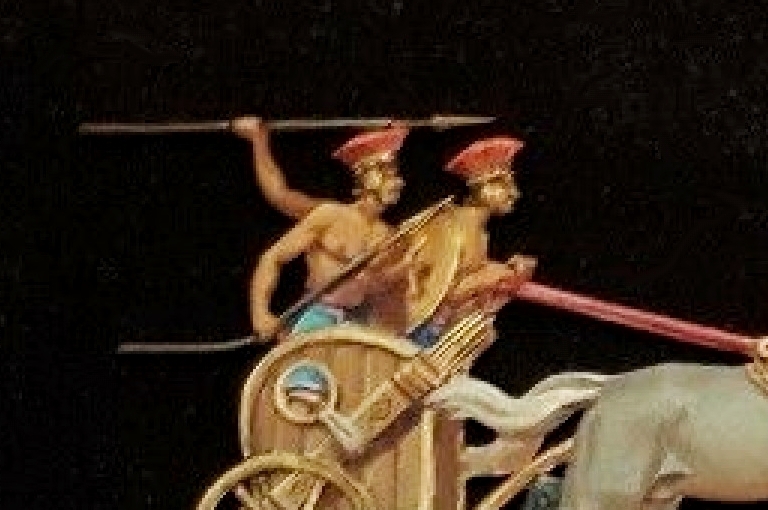 Strange to notice that Douchkine kept and painted both rigth arms of the speerman in the carrirage at top left. French E Bay have 22 Douchkine figures for sale. Currently 281 euros top bid.